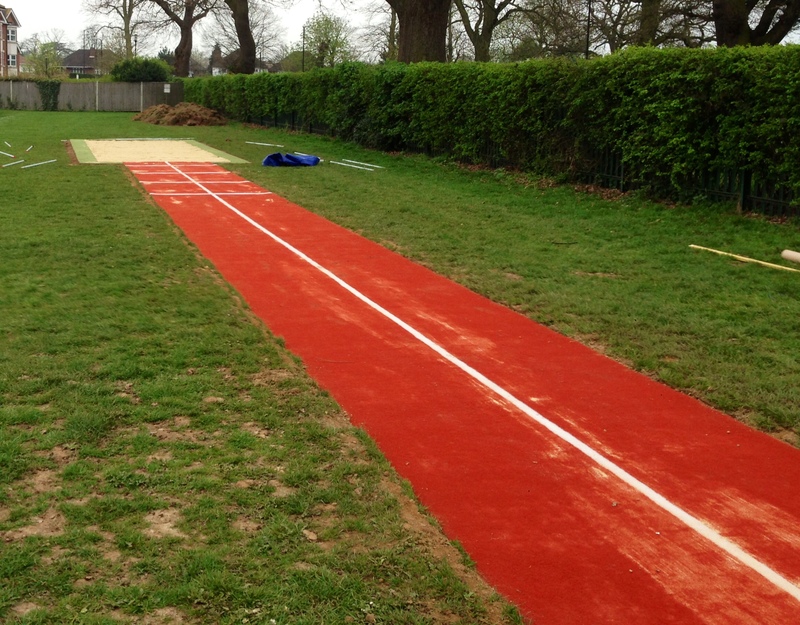 Long jump runway surfacing is more popular than ever within schools, colleges, universities, leisure centres and sports clubs throughout the UK. These facilities are relatively easy to construct and each design can be altered to suit many different budgets and specifications. We can help you choose the perfect design to suit the people who will be using the area. 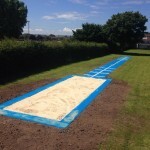 Depending on the amount of space available, we can install a single or multi-lane long jump run up and specialist sand landing pit which will dramatically enhance the athletics facilities at your establishment. The specification is completely up to you so please contact us today to talk about the work in more detail and get an idea of the costs. 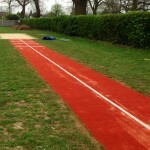 What is a Long Jump Surface? 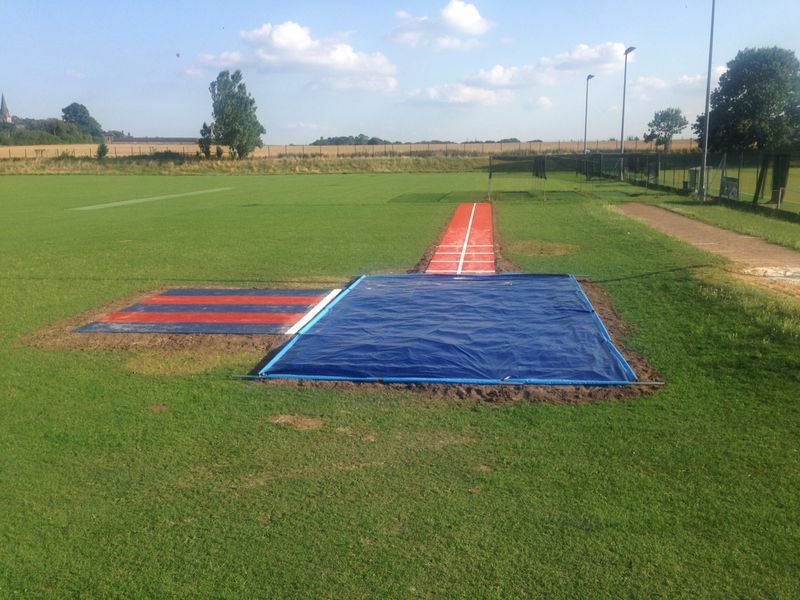 There are many different long jump surfaces used across the UK with many redgra, stone, macadam and natural grass facilities becoming outdated and unsafe for use. 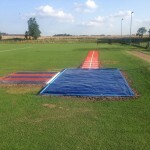 The two main surfaces used within athletics clubs in the UK are polymeric and Multisport™ synthetic jumping track runways. Polymeric Athletics Runway – Polymeric surfacing is made up from EPDM rubber granules which are laid over a solid, porous sub base such as an open textured macadam or no fines concrete at 12mm. 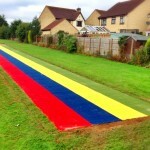 This creates a professional rubber surface athletics track run up suitable for both long and triple jump events. The porosity of this long jump runway surfacing means it allows good water drainage and prevents flooding which can damage the surface and make it unsafe. Polymeric surfacing is available in a wide range of different colours however it is normally laid in red to create a tartan style running track. 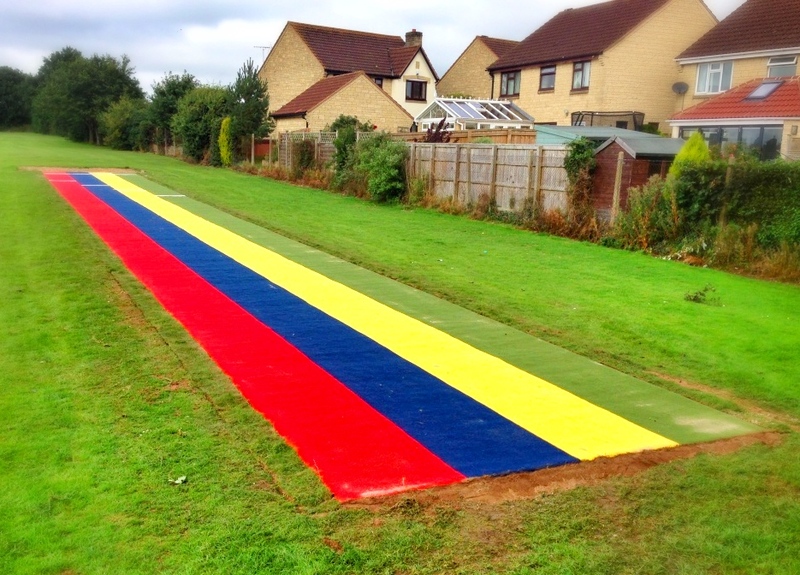 Multisport™ Synthetic Runway – Multisport™ synthetic jumping run ups display a top quality curly yarn fibres which act as a perfect athletic surface. The short pile height and hard wearing nature of the surface means that this run up will look brand new for many years. The synthetic surfacing specifications are tough, available in a wide range of colours that will not fade as easily, do not become slippery when wet and are less prone to vandalism. The multisport™ synthetic surface will also not shrink from the edges over time during changing weather conditions. If you are interested in having a newly constructed or renovated long jump installed in your establishment it helps to provide information including; idea of space available, the location of the job, they type of surface you require and the budget you have in mind. If you can provide this information to a specialist sports contractor, they will be able to offer you costs and advice on the most suitable athletics long jump surfaces for your requirements. 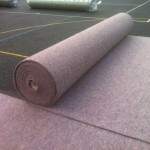 Many schools, colleges, leisure centres and sports clubs would opt for the Multisport™ synthetic surfacing for athletics facilities due to their performance qualities and longevity of the product, however it is solely down to the design and specification set out by each particular client. Synthetic / Rubberised Mowing Strips – mowing strips are commonly installed around the landing pits of these facilities and are used for both aesthetic and specific purposed. A synthetic mowing strip prevents any weed growth and prevents the surrounding grass from entering the sand landing pit when mowing the field during the summer. Rubber Edges Around Landing pit – often used as edging detail around the landing pit in place of PCC and timber edges in order to add extra safety for users. 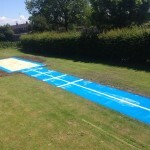 Sand Pit Cover – Bespoke landing pit covers to fit different designs and dimensions. Landing Pit Rake – allows sand to be regulated and spread evenly throughout the pit ensuring safety and aesthetic. 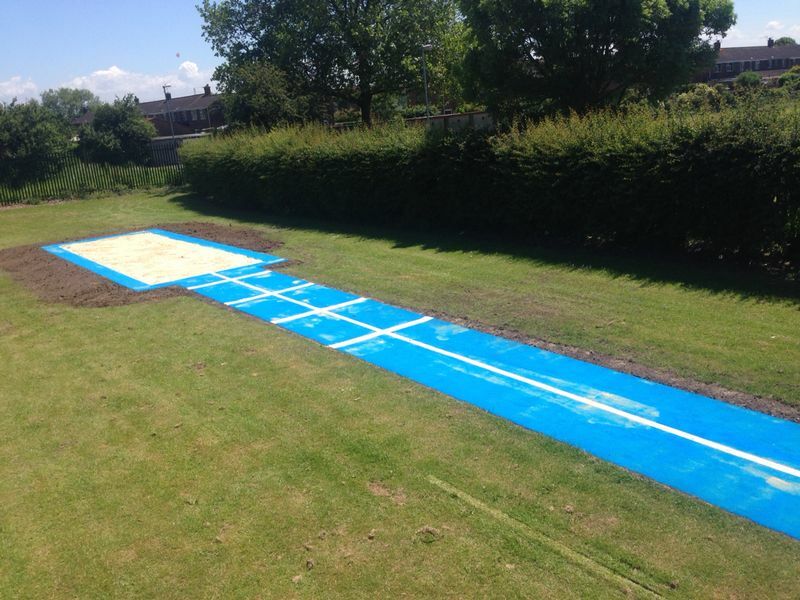 For more information on long jump runway surfacing designs and specifications please fill out the details on our contact form and we will be in touch with information on costs dependent on your budget. There are plenty of options to choose from so we are sure we’ll be able to find the right one for you and your organisation. Be sure to let us know if you have any requirements with regards to design or pricing for this work. We’ll take this into account when putting together a quote to make sure it is suitable for you. 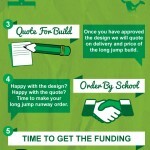 Just include all of the details you can with your initial enquiry. 1 What is a Long Jump Surface?